This is not to say that characters of color in novels should be presented as neutral themselves. “Color-blind” narratives don’t actually help. Making a cast “diverse” by writing them exactly like you would write a white character but giving them “ethnic”-sounding names and darker skin does not accurately reflect the experience of a person of color. Their color IS seen even if some of us white people pretend it doesn’t matter (or that THEY are the problem if they notice and are affected by racism or discrimination). This phenomenon also extends to LGBTQ characters, non-male characters, characters with disabilities and illnesses, and characters from non-majority culture or religions. The “OMG THE PC OVERLORDS ARE COMING TO TAKE OUR FREE SPEECH” crowd sees all of these deviations from “the norm” as attempts to force diversity where it doesn’t belong, in the name of creating an unrealistic, hippy-dippy, artificially diversified picture of humanity. But in reality, THE WORLD ACTUALLY IS DIVERSE, and the “mainstream” voices that drowned out the marginalized ones are actually the ones at fault for making this political. I cannot speak for my friends of color, but I have certainly heard them tell me they’re sick of not having their own narratives in mainstream fiction–that they’re tired of being tokenized or fetishized while being relegated to having their works marketed to “certain audiences” should they dare to put themselves at the center of their stories (while “white” stories are marketed to everyone and presented as if they actually are neutral). I can speak from a female perspective and a queer perspective, though. I am quite irritated that “adding a woman” to the cast is seen the way it is (usually acceptable only as a love interest, taken as a “feminist statement” if she is not designed to be “gotten” by a male character). Stories about girls and women are chick-lit, women’s fiction, “for girls”–even if they’re primarily mysteries, adventures, SF/fantasies, or thrillers. I am quite irritated that if a story has a queer protagonist with a queer experience it’s whisked away to a queer section so we can just talk to ourselves, while if there’s a queer background character it’s usually comedic or strategically placed, and if there’s more than one queer in a story that’s supposed to be mainstream then we’re just pushing the gay agenda on people. And don’t even get me started on disability, which is almost always either an opportunity for someone else to learn from the “inspiration” the disabled person provides OR an opportunity for the disabled person to find a cure or get rehabilitated as the center of their character arc. 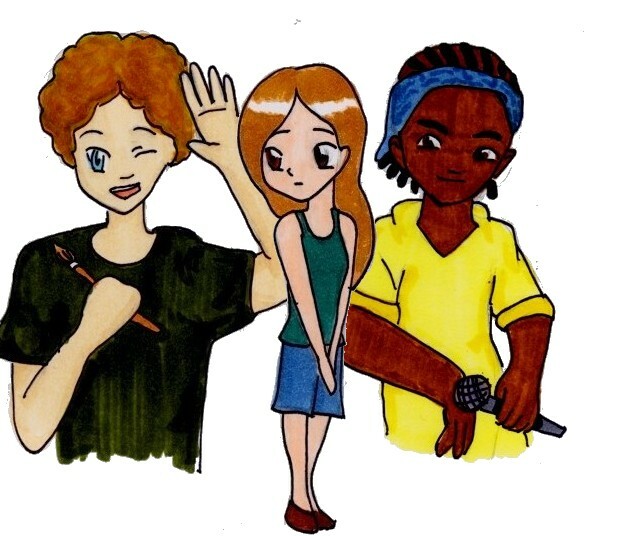 My biracial character in the story referenced in the comic–who is one of three love interest guys, and the other two are black, while the protagonist girls are white–does not have a “reason” to be biracial, nor do the protagonists have a “reason” to develop an interest in more than one person of color except that they happened to be there and that’s who they were. The character’s race is not irrelevant to him as a person, and they do discuss it occasionally in the story, but it is not the center of a story arc and it does not singularly define him. 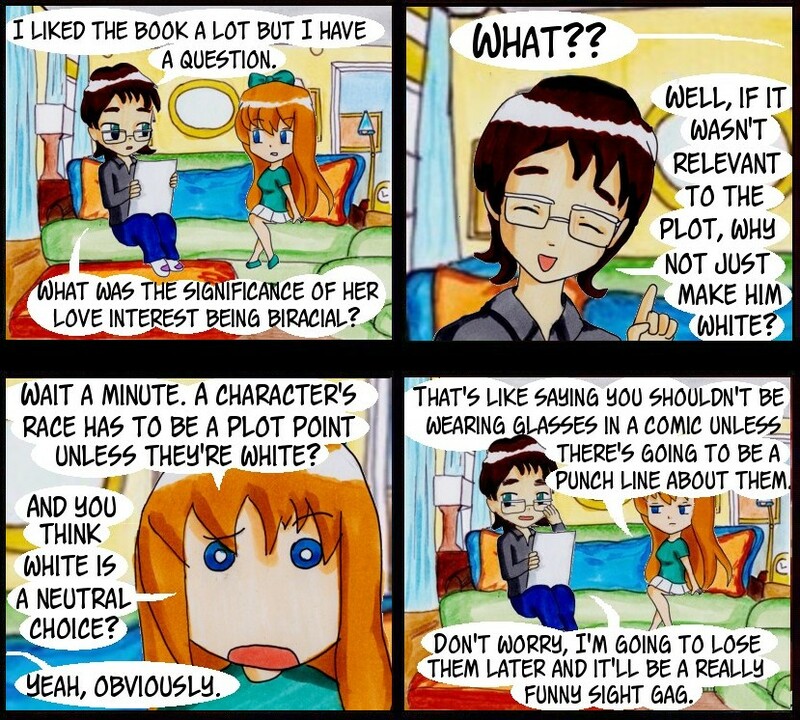 Basically, if you asked me why my love interest is biracial but you didn’t ask me why my protagonist is white, I think you have some assumptions to unpack. Here, have a couple cute doodles of characters from the book.